America’s richest billionaires are competing against each other to see who can give the most to charity and fund causes close to their heart. Here’s a lowdown. When a few years ago, the bill and Melinda Gates Foundation decided to support the “Grand Challenges in Global Health Initiative”, which funds research on scientific problems that, if solved, could lead to advances against multiple diseases, they joined an increasing list of extremely wealthy individuals who had decided it was payback time. 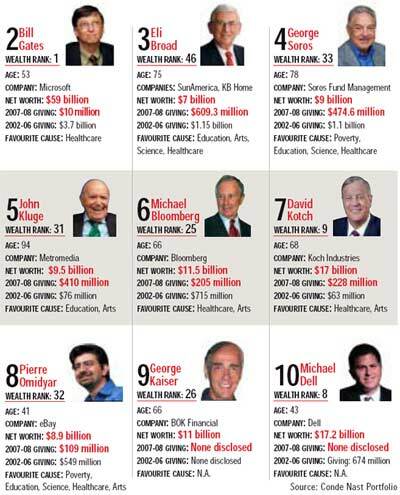 Now a report by Conde Nast Portfolio, aptly titled “The Generosity Index”, has assessed their level of philanthropy by highlighting how much these billionaires have donated to charitable causes over the years. Here’s a look at how the richest in the US spend their money.